This week witnessed the first dispersals of the heroes, or what are considered temporary deaths while upon the demi-plane. However, I have to confess that there was an error in the code that caused them to have a harder time of events than they should have. Basically, three times the amount of Death Walkers spawned than should have done, and as an average of three deaths per player occurred in this one battle, I have amended the players "death counts" by two to account for the error so that the final death count was reduced to one rather than three. Furthermore, I allowed all XP gained in this battle to remain as it is as a compensation. MP Monster AI Fix: Improved Aggressors Target/Aggression AI for MP. MP Monster AI Fix: Improved Passive Sentinel AI for MP. MP Monster AI Fix: Improved Spirit Guardian AI for MP. 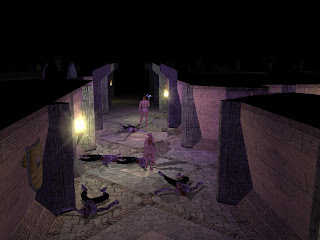 MP Monster AI Fix: Ensured monsters would turn hostile for every player when disturbed. Fixed waiting Death Walker code to prevent it from wandering. Gave a slightly longer pause between menu opening to prevent mixed PC tokens. Fixed an annoying HB pause when a PC was not carrying a valid weapon. Ones that players noticed during the last session in particular were: #5 when a zombie would not turn hostile immediately for all players; #7 when players would sometimes see each others tokens by mistake; and lastly # 8, was one that I noticed during testing and found very annoying: A PC would stop during a heartbeat for no reason if they were not carrying a weapon. All these fixes have now been put in place for our own game, and I hope the extra fixes have nipped problems in the bud before we get to them. EXTRA INFORMATION: I had thought that this next piece of information was available in the game manual, but, after checking, found that it was something I had covered in the Walkthrough manual instead. Therefore, if I come across something that was raised during a session and where a player can benefit from this extra information, I may at times (like now) quote parts of the Walkthrough manual . NB: AT THIS TIME PLAYERS SHOULD NOT REFER TO THE WALKTHROUGH MANUAL BEYOND WHAT IS COVERED HERE. "BOOKCASES & LORE BOOKS: Some bookcases will drop lore books that will aid the PC through the Realm by offering bonuses to certain skills. If playing in a MP game, care must be taken not to pick up a book that may be useful to another PC in your group. If a book is of the same or lower level than you have already studied, then the study of the lore book will be abandoned." "LORE BOOKS: It is worth remembering that acquiring Lore Books can sometimes allow a PC to use a skill when they otherwise may not have been able to. E.g. If a weapon requires an Amend skill of 4 or higher and the PC only has Amend skill of 2, but also an Amend Lore of 2, then the total score of 4 will allow them a chance to amend the weapon. They will be at the minimum chance of success and the cost of trying will be high, but it may be worth the attempt. The skills do not always add in the same way as this, and so experimentation during play is the answer." "Myara had strayed from the group as they made their way and was attacked by some wandering Death Walkers, which overwhelmed her and caused her to be dispersed once more. She was the first to discover the price paid when her soul was restored at the Soul Regenerator: Ten of her Spirit Fragments had been lost in the process. Eventually, Myara managed to catch up with the other two, bringing chasing Death Walkers in her wake."